The GMU Forensics Team is an intercollegiate speech team. We represent George Mason University at regional and national speech competitions in much the same way the Patriot track and basketball teams do. Forensics is public speaking and oral interpretation of literature, with events designed to focus on each of the ways the spoken word can be used to persuade or move an audience. 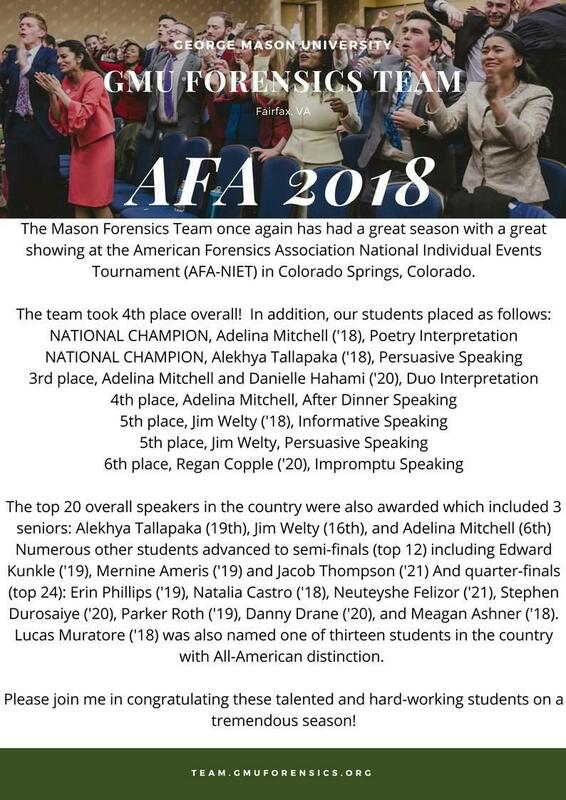 GMU Forensics has been the most successful team in George Mason's history, continuously ranking in the national top 35 schools every year since 1975, the top 5 schools each year since 2007, and even garnered the National Championship in 1979. One published study revealed that GMU is one of the few schools on the national level that has, over the past twenty years, remained solidly among the top programs. TOGETHER. FOR THE RIGHT REASONS.